Having witnessed dozens of enticing encounters among hundreds of teams over the last many days and after winning the hearts of millions of football lovers and players, the 3rd season of STAIRS School Football League (SSFL) -- which was kicked off by Shri Vijay Goel, Minister of State, Ministry of Youth Affairs & Sports, on Oct 19th, 2016, at Thyagaraj Sports Complex in New Delhi – came to an end on Thursday, Dec 1, 2016. Shri Rajiv Yadav, Sports Secretary, Government of India, presided as the Chief Guest for the closing ceremony, while many other dignitaries graced the occasion with their presence. Mega sports event SSFL-3 saw more than 30,000 school-level footballers from 2000 schools of Delhi & Gujarat participating in the tournament. 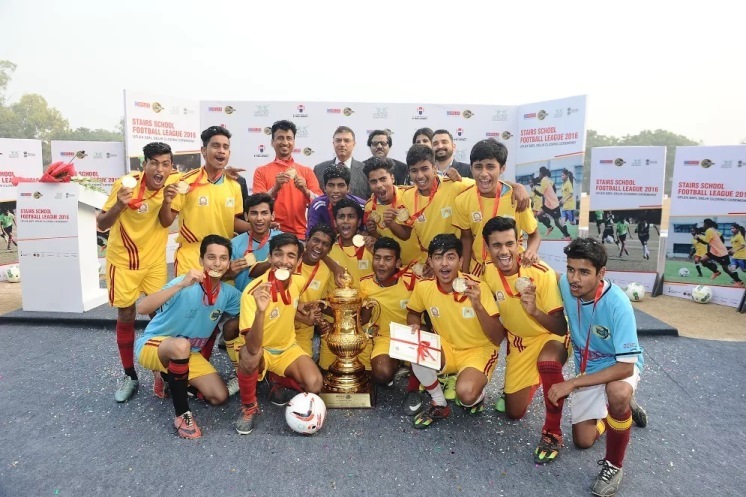 During the event 4000 matches (500 in Delhi and 3500 in Gujarat) were played, making it the biggest as well as the longest-ever football league at the school level. A total of 256 teams, comprising 128 teams of under 14 boys and 128 teams of under 17 boys, participated in the tournament. Apart from the boys’ team, the tournament also witnessed avid participation from 32 girls’ teams in U-14 and U-17 categories. The closing event was followed by a prize distribution ceremony, during which trophies, medals and certificates were given to the winning team and players for showing exemplary performance. Shri Rajiv Yadav, Sports Secretary, congratulated the winning team for their gritty win and thanked all the participants for their enthusiasm and passion for the game of football. He also assured all future support to the STAIRS School Football League, world’s biggest football scouting and training programme at the school level, and other initiatives of STAIRS in order to encourage and develop sports at the grassroots level. SSFL-3 began with league matches at over 8 different venues across four zones in Delhi while the semi-final and final games were played at the central venue. The event was solely meant for the children under 14 years and under 17 years of age and exactly followed the FIFA World Cup format. All the participating school teams also had to go through the qualifier rounds. For the 3rd season, SSFL got assistance from Sakaar Association for all its matches in Delhi and from Gujarat State Football Association for all Gujarat-based matches. Uflex is India’s largest end-to-end flexible packaging company and an emerging global player. Since its inception back in 1985, Uflex has grown from strength to strength to evolve as a truly Indian Multinational with consumers spread across the world. Uflex today has state-of-the-art packaging facilities at multiple locations in India with installed capacity of around 100,000 TPA and has packaging film manufacturing facilities in India, UAE, Mexico Egypt, Poland and USA with cumulative installed capacity in excess of 337,000 TPA. Photo Caption: Shri Rajiv Yadav, IAS, Secretary, Parliamentary Affairs; Shri. R.K Jain, Group President, Uflex & Mentor STAIRS and Shri. Siddhartha Upadhyay, Founder and Secretary General, STAIRS facilitating the team from Nalanda Public School, winners of 3rd SSFL League (Under 17 boys).